With less than 200 hours, this impeccably maintained 391 Sedan is one of the cleanest yachts available. The bottom paint is 7 layers and is current. This yacht has always been stored under cover and waxed very year. The Salon TV has been upgraded and the stereo is impressive with a subwoofer and 3 amps. 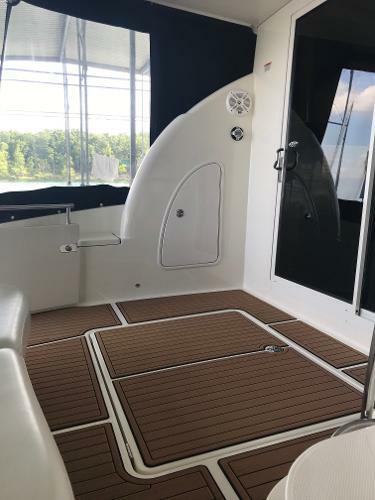 Sea Deck Faux Teak has been installed on the swim platform and the entry to the salon. It has 2 boat safe bilge heaters installed. It does have the must have options: Foredeck Sunpad, Bridge refrigerator, cocktail table, two Zone Air conditioning, Central Vac, Kohler 10kw Gas generator. Knowing that some family cruisers look like minivans, Meridian designed its 391 Sedan to bring the styling and performance of a sportscar to the class without losing any practical features. This attractive yacht's sleek profile conceals a wide-open salon with warm cherry-wood interior, premium-gloss finish, homelike seating arrangements and 360-degree views of the horizon. She also features a dedicated dinette and fully-equipped galley that are seamlessly integrated into the main living space, two large staterooms and separate shower and head compartments, each with its own vanity and sink. The flybridge's distinctive overhang offers more space topside as well as cockpit weather protection, and its molded-in steps are hinged to provide direct engine-room access. Why settle for a floating box on the water when you can enjoy all the style, performance and comfort of the 391. **PRICE JUST REDUCED $25K** *Fresh wax and detail* This is one of the most incredible yacht designs in the industry. The attractive and sleek profile conceals a wide-open salon with 360 degree views of the horizon. This yacht features a two stateroom layout that has separate shower and head compartments, each with its own vanity and sink. There is a gracious master suite, located forward with a queen size island berth and a spacious mid-ship guest stateroom with plenty of storage. The flybridge’s distinctive overhang offers plenty of seating, much larger than most yachts in this class. The molded-in steps are hinged to provide direct and easy engine-room access. The yacht features two reverse-cycle AC units, a black Sunbrella full enclosure, and fully enclosed aft lounge deck. The huge flybridge is a complete entertainment space that includes a refrigerator, sink, large table and plenty of seating. The helm seat offers great visibility and all the electronics you need, including navigation, autopilot, and bow and stern thrusters for easy maneuverability. 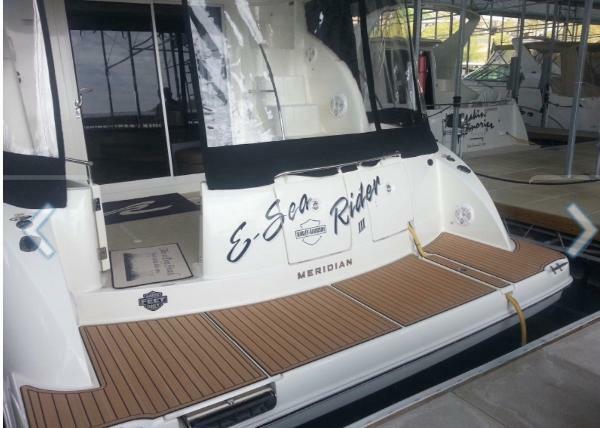 This 2007 391 Meridian has it all and is ready to go. The boat is powered by twin diesel 380 hp Cummins with 640 hours. Much of this boat’s life has been spent in fresh water, and now resides in St Petersburg, FL. 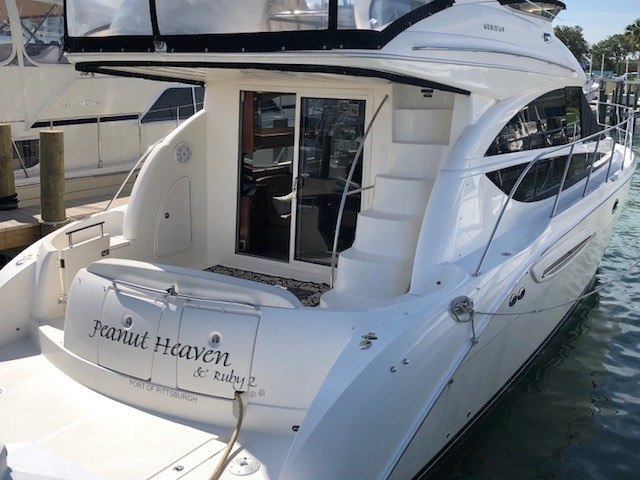 This boat offers many recent upgrades, including a KVH satellite tv system, Fusion MS-AV750 stereo unit and remotes, new outdoor wet sound speakers and dedicated amp, stainless steel microwave, and upgraded television in the salon, to name a few. 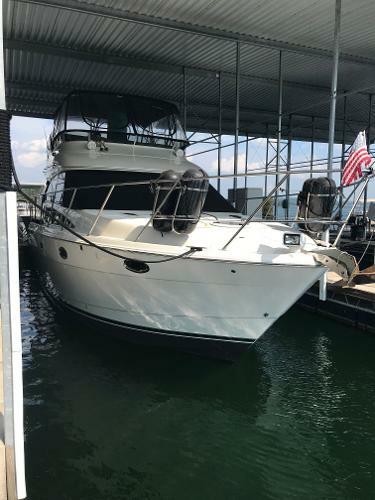 The motivated seller has this yacht in pristine condition and is ready to move onto his next vessel.